Happy 2319 — It is a special day that only comes around once every 100 years! It is February 3rd, 2019… or TWENTY THREE NINETEEN! On this special day, Joe Foo and Emily draw a “before and after” sketch. In his “before” sketch, Joe draws a fluffy, hairy monster. In her “after” sketch, Emily draws the same monster, but without any hair! Join us on 2319 and draw! The possibilities are endless! You can draw Emily’s version of the monster with a new hair cut, or you can draw a new body for Joe’s monster. Of course, you can always create your own “before” and then pass it to a buddy to draw the “after”. What ever creative way you choose, just have fun! This is a special edition video and Joe and Emily collaborate on a sketch. We encourage you to collaborate with others on your sketches. The results will be unpredictable, but hopefully will spark some creativity! Do not force an outcome, rather enjoy the absurdity that comes from it. Joe and Emily use an inexpensive mechanical pencil (1.3mm lead) and a Zebra Brush Pen to draw their monsters. 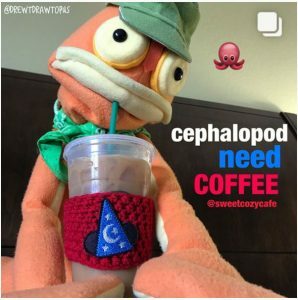 If you have any questions about supplies or techniques, post them to the comments on the YouTube channel, or find Joe Foo or Drew T Drawtopus on Instagram (links below). Celebrate 2319 and draw some fluffy monsters! Let’s see what you can do! Post your art to social media and use the hashtag #CAMPPENCILPOINT. 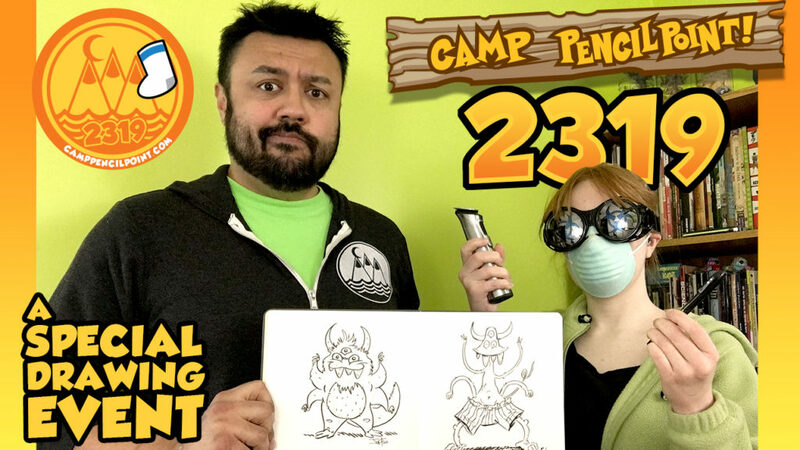 If an artist from Camp PencilPoint finds your monster sketch and comments on it, you will have earned your digital badge for the 2319! Please subscribe to our YouTube channel for all the latest drawing videos! Visit http://camppencilpoint.com for more tutorials, news, appearances and arts and stuff. Check out the all of our videos and enjoy the of nonsense and tomfoolery! Sketch by Joe Foo and Emily Zelasko.